Textkernel received the META Seal of Recognition for its product Extract! CV parsing at the META Forum in Brussels yesterday. This is the second award Textkernel received in two days for its semantic recruiting technology. 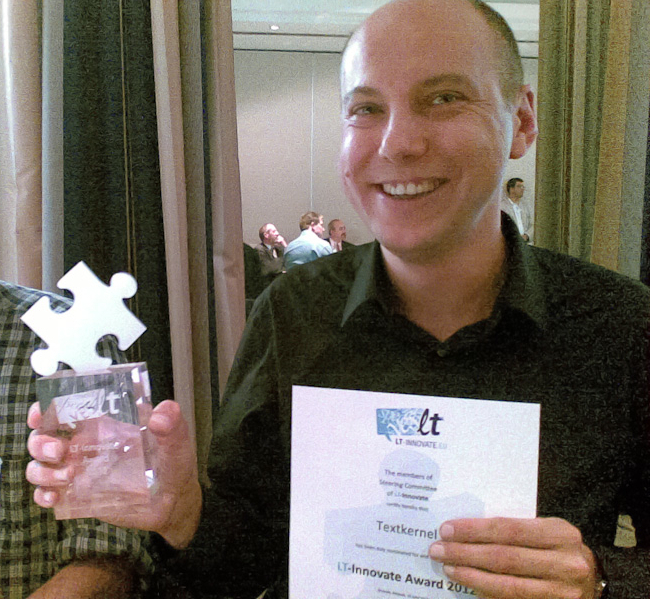 Tuesday Jakub Zavrel, CEO of Textkernel, received the LT Innovate Award 2012 for working towards a transparent European labour market. The Meta Seal of Recognition was awarded to Textkernel for contributing to the European Multilingual Information Society with Extract! CV parsing. Textkernel received the META Seal of Recognition for its product Extract! CV parsing at the META Forum in Brussels yesterday. The META Seal of Recognition is awarded to products and services that actively contribute to the European Multilingual Information Society. Previous winners of the Seal include Google Translate, Lucy LT, SVOX TTS, Systran7 and TDA. Textkernel was founded in 2001 as a commercial R&D spin-off from research in Natural Language Processing and Machine Learning at the University of Tilburg, Antwerp and Amsterdam. Textkernel develops software and supplies information that helps match demand and supply in a multilingual labour market. The award-winning software Extract! CV parsing extracts and structures information from a CV. Textkernel’s Search & Match solutions help HR professionals to efficiently find the right candidates for a job. On the demand site Textkernel offers insight into the labour market with Jobfeed in the Netherlands, Germany, Italy and France. For more information see https://www.textkernel.com. META, the Multilingual Europe Technology Alliance brings together researchers, commercial technology providers, private and corporate language technology users, language professionals and other information society stakeholders. META is preparing the necessary ambitious joint effort towards furthering language technologies as a means towards realising the vision of a Europe united as one single digital market and information space. The META Seal of Recognition is awarded annually to select products and services which actively contribute to the initiative’s goals. For more information see http://www.meta-net.eu/meta-seal. Would you like to more information on this topic?